Sweet potatoes are an often over-looked vegetable. This is unfortunate, as they contain an abundance of beneficial vitamins and nutrients. They are inexpensive, always readily available, and taste great. Eating sweet potatoes can help your body control blood sugar and improve your overall health, among other benefits. If you are looking for reasons to eat sweet potatoes, look over some of the additional advantages of this super vegetable. First off, sweet potatoes is one of the rare vegetables that contain vitamin B6. This vitamin helps to reduce the levels of a chemical called homocysteine—which has been linked to heart attacks and various degenerative diseases. Sweet potatoes are also a good source of vitamins C and D. Vitamin C helps boost your immune system and is an excellent antioxidants that reduces damages done by free radicals. Both vitamins are necessary for bone growth, digestion, and blood cells formation. Eating sweet potatoes will provide you with iron, magnesium, potassium, and beta-carotene. Iron and magnesium are a couple other useful minerals for boosting your immune system and helping to reduce stress. Magnesium also helps promote better heart health and red and white blood cell production. The beta-carotene found in sweet potatoes is converted into vitamin A by your body when needed, thus there is no toxicity of overdose. Vitamin A is needed to improve eyesight, your immune system, and is a powerful antioxidant. By eating sweet potatoes, you are receiving beneficial vitamins and nutrients that will help control your blood sugar and increase your immune system. More reasons to love sweet potatoes. There are a few precautions, when you go to the store to buy sweet potatoes. Always check the sweet potatoes before buying. Make sure that they are firm, without any bruises, cracks, holes (think worms) or soft spots. You should also avoid sweet potatoes stored in refrigerated aisles, as the colder temperature can affect the taste. When you get your sweet potatoes home, you should store them in a cool dark place, but not in the fridge. They should remain fresh for up to ten days. Always use only organic sweet potatoes! If you are looking for a way to include sweet potatoes in your diet, you will love this sweet potato juice recipe. It makes a great breakfast or snack and is easy to prepare. You can use your juicer, or if you do not have a juicer, use your blender. 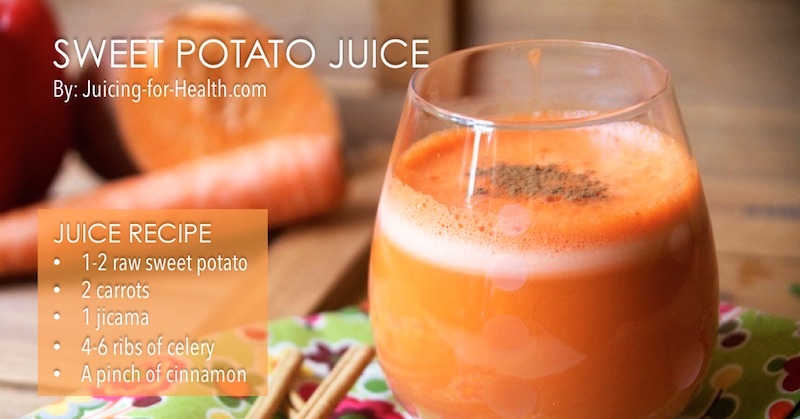 To make your own sweet potato juice, juice all of the produce from the ingredients listed above. Always use organic where possible. Combine the juiced ingredients and sprinkle a little cinnamon on top. Use this recipe to start adding sweet potatoes to your diet. Have sweet potato juice for breakfast, lunch, or as a midday snack to include more vitamins and minerals in your diet. Good day, I would like to ask you how can I order the 2 books. The healthy pretty happy ways to juicing and The healthy pretty happy juice recipes. Right now I am working in Macao as a domestic helper. Please help me. I benefit a lot from your site and have seen improvements and also learned a lot about natural fruit and other stuff right in my kitchen and backyard, amazing, looking forward for other great stuff. One of the most important benefits of sweet potato juice is easing bowel transit. This is due to high fiber content. Also cleanses the gastrointestinal tract and helps you have a healthy digestion, also is an extremely good remedy for constipation. Sweet potato juice is a rich source of folic acid, so it is advisable for pregnant women. Also, regular consumption can reduce inflammation in the body and relieves stress due to magnesium content. This is an anti-stress mineral, which relaxes both body and mind. Being a good source of vitamin C, potato juice is a good treatment for colds, flu and minor infections. Accelerates wound healing and proper functioning of the immune system. Also, the iron content of the sweet juice helps the body in proper metabolism of proteins and provide you energy for the day. At the same time, sweet potato juice contains potassium, which is extremely important for the health of the human body. Potassium deficiency leads to muscle cramps and sensitize all body muscles. Can you use a vitamix for this recipe? Hi Denice, it is not recommended to use vitamix for this recipe, as you cannot blend raw sweet potatoes. If you only have a vitamix, then I suggest you boil or steam the sweet potato and use it to make a smoothie instead. What about the sugar content of the sweet potatoes and carrots for people with diabetes? Isn’t that too high of sugar? Hi BB, you will be surprised that sweet potatoes and carrots actually regulate blood sugar level. Always use organic, though!